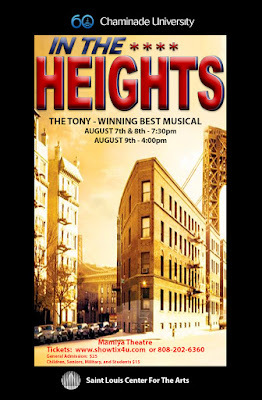 The Performing Arts Department of Chaminade University in association with Saint Louis Center for the Arts will present the Tony Award winning musical In the Heights, with music and lyrics by Lin-Manuel Miranda and book by Quiara Alegria Hudes, at 7:30 p.m. on August 7 and 8, and 4 p.m. on August 9, at Mamiya Theatre, 3140 Waialae Avenue, Honolulu, Hawaii 96816. The production is part of Chaminade's summer collegiate theatre program and features five Academy alumnae: Alyassa Ablao, '15, Erica Freitas, '15, Kaena Kekoa, '14, Angelyn Tabalba, '15, and Nicole Yamada '15. This presentation of In the Heights is a summer theatre program featuring student actors, designers and technicians from universities all over the country including the University of San Diego, Gonzaga University, University of Portland, Northern Arizona University, Point Loma Nazarene University, Chapman University, Webster University, Ithaca College, Stetson University, Hawaii Pacific University, University of Hawaii Manoa, Leeward Community College, Honolulu Community College, and Chaminade University. The cast will also include a select group of local high school students. In the Heights is an award-winning musical about life in Washington Heights, a tight-knit community where the coffee from the corner bodega is light and sweet, the windows are always open, and the breeze carries the rhythm of three generations of music. During its acclaimed Off-Broadway run, In the Heights quickly became an audience phenomenon and a critical success. It’s easy to see why: with an amazing cast, a gripping story and incredible dancing, In the Heights is an authentic and exhilarating journey into one of Manhattans most vibrant communities. And with its universal themes of family, community and self -discovery, In the Heights can be enjoyed by people of all ages and backgrounds. Tickets will be available at the door and cost $25 for reserved seating and $15 for children, seniors, military, students, and for Chaminade faculty and staff. Advanced tickets using a credit card may be done through www.showtix4u.com. For more information call 808-202-6360.